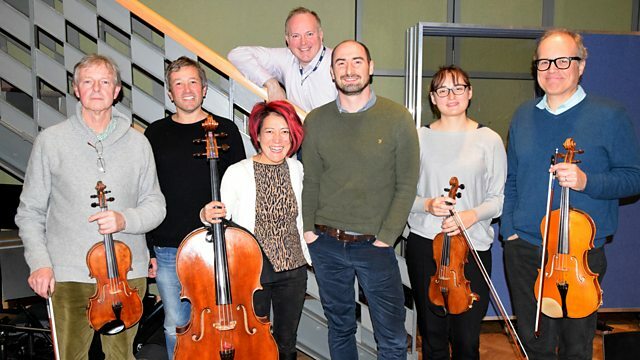 To mark their 20th anniversary, Mr McFall's Chamber perform live in the Classics Unwrapped studio and Gavin Reid chats about his new role at the Scottish Chamber Orchestra. To mark their 20th anniversary, Mr McFall's Chamber perform live in the Classics Unwrapped studio and Gavin Reid chats about his new role as chief executive at the Scottish Chamber Orchestra.This week's 'My Music' is chosen by actor Gordon Munro and Jamie looks ahead to the varied concerts that will be commemorating Armistice Day. Music Arranger: Christopher Duncan. Performer: Scottish Festival Orchestra. Conductor: Sir James MacMillan. Performer: Mr McFalls Chamber, Dominic Waxing Lyrical. Performer: Tafelmusik, Jeanne Lamon (violin). Performer: Slovak Radio Symphony Orchestra, Slovak Philharmonic Chorus. Conductor: Stephen Gunzenhauser. Performer: Katherine Bryan, Royal Scottish National Orchestra. Conductor: Jac van Steen. Performer: Joan Sutherland, London Symphony Orchestra. Conductor: Richard Bonynge. Performer: Evelyn Glennie, Scottish Chamber Orchestra Strings. Conductor: Paul Daniel. Symphony No 41, finale mvt. Performer: Scottish Chamber Orchestra. Conductor: Sir Charles Mackerras. Performer: Nicky Spence, London Mozart Players, Portsmouth Grammar School Chamber Choir, Oxford Bach Choir. Conductor: Nicholas Cleobury. Performer: Robin Tritschler and Malcom Martineau. Performer: Hilary Hahn, Cory Smythe. Performer: SCO Chorus. Conductor: Gregory Batsleer. Performer: BBC Scottish Symphony Orchestra. Conductor: Martyn Brabbins.